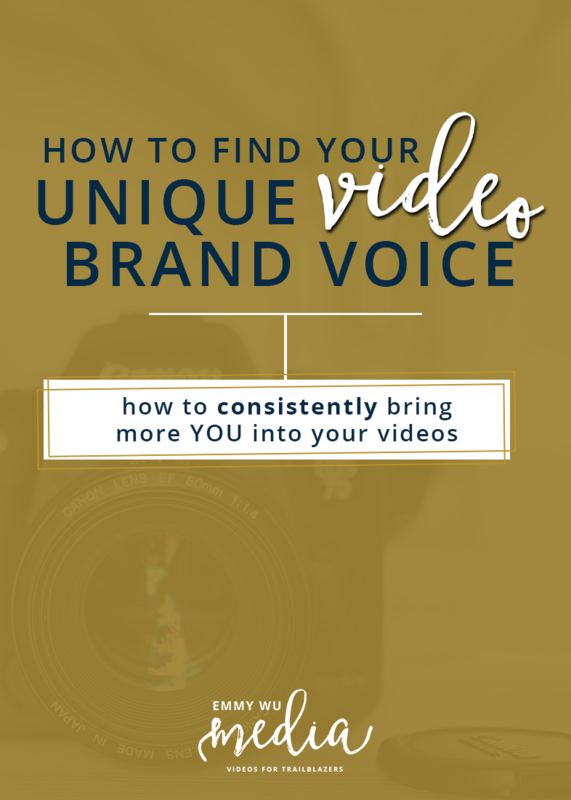 Sometimes, we get caught up in the purpose of our videos, that we forget that it’s our unique brand voice that ultimately captures the attention of the right audience. We might start to meander on our topics, or compromise the things that we get super jazzed about, for the demand of the market. When it comes to creating videos that stand out, I always start with the client’s brand message … from there, we build the script and story, and all the other elements that come together to support your message. In this video, I wanted to share some ways that you can consistently bring out more and more of your own style into your videos. GETTING CLEAR ON YOUR MESSAGE & CONSISTENTLY SHARING CONTENT AROUND THIS TOPIC. What’s that thing that you love so much that you could talk about all day long, that never gets boring for you? I know that this is easier said than done, because for most people, there might be a few things, or it might even be hard to figure out, “what IS that one thing about me?” Or better yet, what if that “thing” is completely irrelevant to your niche?Well, the truth is, we ALL have that one super power that makes us different, but a lot of us don’t go through the pre-work to really discover what that is. Or, we doubt that our thing is really a “thing”. Trying doing this. On a sheet of paper, write down 3-5 topics that you absolutely love. Now, can you see any commonalities between the topics? For example, maybe your niche is in business coaching, love travel, and old movies, cool music videos but these seem totally irrelevant. But maybe you also love organizing things and being a connector for people. Dive a little deeper to recognize some patterns in these topics and the things that you’ve done in your life and business. And if it doesn’t come to you right away, that’s totally okay. Sometimes, our “it” thing comes out more in certain situations and events, so keep an eye out for that moment when you feel totally sparked by inspiration and know that it’s totally aligned with who you innately are. Once you get really clear on what your “it” thing is, you’ll want to repeat it in your marketing over and over again. “But won’t people get bored of hearing me say the same thing over and over again.” Surprisingly, no. This is how you gain recognition and trust over time. Because you gotta realize, some people come into your circle but won’t pay too much attention to you just yet. But it’s over the course of time, when you’ve repeated your message, over and over, possibly years later that they’ll eventually want to work with you or refer you to one of their friends. You’ll also notice that over time, less people will ask what you do, because your brand message will already be associated WITH YOU. You’ll begin to attract the people who are looking for exactly what you have to offer. How do you speak in real life? Do you use words like awesome or totally? Don’t compromise your video language for the sake of looking a certain way. And this even goes deeper than the specific words you use, it also spills into how you speak about topics and even the types of content that you create. Are you a nitty-gritty details type of person? Or are you a broad-strokes, big picture type of person? Knowing how you speak and how you teach things to other people will make it easier to come up with content, write your video scripts and, ultimately, speak about them on camera. If you ever struggle with this, definitely try to prepare your content using language that sounds exactly like how you speak. Simple words, in short sentences. You’ll find that it’s not only easier for you, but it’s a lot easier for your viewer to process and digest as well! I love this one because the art of storytelling is sometimes so overlooked in online marketing. There are a lot of other entrepreneurs and business owners in overlapping niches, but what will make you stand out is how YOUR story helps your viewers, or potential clients, to achieve the goals and results that they’re looking for.This ties back to your “it” thing because by sharing your experiences, the lessons you’ve learned, your joys, and even your grief and crushing defeats, you connect with your audience on a much deeper level. You start to create a more 3 dimensional personae of who you really are. You’re not just a service provider, but your experiences have led you through a unique journey that’s armed you with the tools and knowledge to deliver in a way that’s different from anyone else out there. When you start to brainstorm for relevant brand stories, you’ll always want to think of experiences, whether that’s a past job, or a personal experience, that had an unusual or interesting turning point or lesson. And this lesson has helped you to see your work and niche in a totally different light. Now, a really important thing that I wanted to bring up too, is that you don’t have to have your exact brand message figured out right now. Because chances are, it will evolve just as your business grows. Just choose something that feels right and is aligned with your fundamentals and the work that you want to deliver. Love this!! This is EXACTLY the advice I was looking for! I’m in the middle of recording my first video series ever, and it’s coming out 50% crazy and non focused…and 50% way TOO cardboard and boring. I think I’ll head over to your Youtube page and see what else ya got! Thanks Emmy!